Getting an even “wandering” effect is hard, as I suspected, as is maintaining an even stitch length. I started out with a fairly tight pattern and loosed up as I went along, but I seem to fall into the same pattern constantly – little fingers, as opposed to nice puzzle pieces. The top is simple layer cake squares, so I’m not sure free-motion quilting would look good on it. It seems to say to me, “simple straight lines.” Sadly, that’s going to take the longest, I fear… so I’m back to tying. But first… I gotta baste the sucker. Damn! Fortunately, it’s only 48″ x 48″, so perhaps it won’t be quite so bad… maybe? Maybe wandering, straight-ish lines… bah, wish I had more time to figure this out! Also, I did figure out how to bind off last night – I think the leap of faith was just “dropping” the stitch once I’d pulled it off the right needle. I also figured out how to regulate tension a bit better by pulling on the working yarn. Bound off the dish/wash cloth, dropped down to a size 7 needle to see what smaller/tighter knitting is like. I think I’ve got a bit too tight, though, as it’s a bit stiff moving the stitches around on the needles. Still having weird looseness problems on the endmost stitches… I seem to be doing it wrong. I think your stippling looks great! I have only tried once and it was a total failure. I don’t have a darning foot yet. Jennifer – the darning foot makes All the Difference. I tried once without it and it was a complete disaster. Hey, that looks damn good for a first attempt! 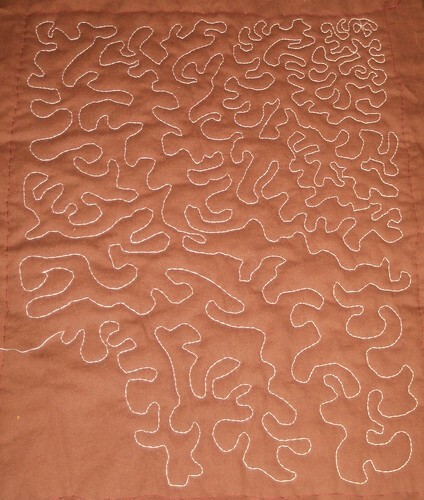 I’ve put aside the mammoth quilt I was trying to stipple, and have been doing placemats instead. Gives me all the pleasure of piecing and quilting, with quick results, and I can stipple the bejeezus out of them in no time flat. I think your knitting sounds like typical newbie issues that clear up with more practice. I love this! It reminds me of coral, really beautiful! Oh hey, it does look like coral! 🙂 Thanks for the comment. looks amazing. My SIL has a machine that she can move across large spaces.. is it called a long arm or something..
Did you do this on a regular machine? Hey – I have been lurking here for a bit. I am a self-taught, come-to-it-late, non-girly quilter myself, so I can relate to so much! Merry merry to you, and happy quilting! Y’know, regarding the speed thing, the guy at the sewing machine shop told me “the faster the better,” but I just nodded and smiled, thinking he was insane. I’ll have to try speeding things up a bit to see how it goes. Your idea about doodling is a good one, too, I wouldn’t have thought of that since I’ve never been much of a drawer.